Palmyra Atoll is an unoccupied incorporated territory by the United States federal government. The variable temporary population of 4–20 "non-occupants" are staff and scientists employed by various departments of the US government and The Nature Conservancy, as well as a rotating mix of Palmyra Atoll Research Consortium scholars pursuing research. Palmyra is one of the Northern Line Islands (southeast of Kingman Reef and north of Kiribati Line Islands), located almost due south of the Hawaiian Islands, roughly one-third of the way between Hawaii and American Samoa. 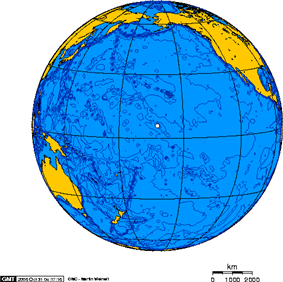 The atoll is 4.6 sq mi (12 km2), and it is located in the equatorial Northern Pacific Ocean. Its 9 mi (14 km) of coastline has one anchorage known as West Lagoon. The atoll consists of an extensive reef, two shallow lagoons, and some 50 sand and reef-rock islets and bars covered with vegetation—mostly coconut trees, Scaevola, and tall Pisonia trees. The islets of the atoll are mostly connected. Sand Island and the two Home Islets in the west and Barren Island in the east are not. The largest island is Cooper Island in the north, followed by Kaula Island in the south. 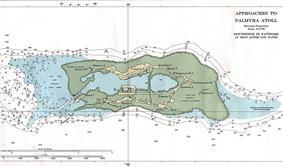 The northern arch of islets is formed by Strawn Island, Cooper Island, Aviation Island, Quail Island, Whippoorwill Island, followed in the east by Eastern Island, Papala Island, and Pelican Island, and in the south by Bird Island, Holei Island, Engineer Island, Tanager Island, Marine Island, Kaula Island, Paradise Island, and Home Island (clockwise). Average annual rainfall is approximately 175 in (4,400 mm) per year. Daytime temperatures average 85 °F (29 °C) year round. Palmyra is an Act of Congress specifying how Palmyra should be governed. Palmyra has no permanent residents, however, in 2004 accommodations were built to support a small number of temporary inhabitants. The only relevant federal law simply gives the President the authority to administer Palmyra as he best sees fit (see Section 48 of the Hawaii Omnibus Act, Pub. L. 86–624, July 12, 1960, 74 Stat. 411, attached as a note to former sections 491 to 636 of Title 48, United States Code). The issue of the governing of Palmyra is generally a moot point, since there is no permanent population remaining there, nor any reason to think that there will be in the future. Palmyra is the only unorganized incorporated territory of the US. Cooper Island in this atoll is owned by The Nature Conservancy which manages it as a nature reserve. The rest of Palmyra is federal land and waters under the jurisdiction of the U.S. Fish and Wildlife Service. Since Palmyra has no local government at all, it is administered directly from Washington, D.C., by the Office of Insular Affairs, of the U.S. Department of the Interior. For all other purposes, Palmyra is counted as one of the U.S. Minor Outlying Islands. There is no current economic activity on Palmyra. Most of the roads and causeways there were built during World War II. All of these are now unserviceable and overgrown with bushes and grass. 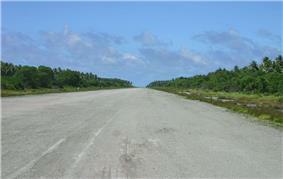 There is a 2,000-meter-long, unpaved, airstrip on Cooper Island (Palmyra (Cooper) Airport, ICAO code PLPA), that was built for the Navy during WW II. A construction program in 2004 consisted of several two-person bungalows and showers for the temporary residents. Fresh water is collected from the roof of a concrete building in this area. The communal buildings of the area on the north side of Cooper Island (the only occupied area of the atoll) consist of a common cooking and dining building next to the only sea dock, and there is a kayak and scuba diving equipment storage building adjacent to this. Palmyra Atoll's location in the Pacific Ocean, where the southern and northern currents meet, means that its beaches are littered with trash and debris. Plastic mooring buoys and plastic bottles are plentiful on the beaches of Palmyra. Palmyra was first sighted in 1798 by captain Edmund Fanning of Stonington, Connecticut, master of the American merchant ship Betsy, on a voyage to Asia. Fanning had woken three times during the night before. After the third time, he took it as a premonition, and he ordered Betsy to heave to for the rest of the night. The next morning, Betsy resumed sailing, but only about a nautical mile further on, she reached the reef of Palmyra. Had the ship continued on her course at night, the ship might have been wrecked. On November 7, 1802, USS Palmyra under Captain Sawle was shipwrecked on the reef, which was given the name of this vessel. In 1859, Palmyra Atoll was claimed for the United States by Dr. Gerrit P. Judd of the brig Josephine, in accordance with the Guano Islands Act of 1856, but there was no guano there to be mined. On February 26, 1862, King Kamehameha IV of Hawaii commissioned Captain Zenas Bent and Johnson Beswick Wilkinson, both Hawaiian citizens, to take possession of the atoll. On April 15, 1862, it was formally annexed to the Kingdom of Hawaii, while Bent and Wilkinson became joint owners. Over the next century, ownership of the atoll passed through various hands. Bent sold his rights to Palmyra to Wilkinson on December 25, 1862. Palmyra later passed to Kalama Wilkinson (Johnson's widow). In 1885, it was then divided between three heirs, two of whom immediately gave their rights to William Luther Wilcox who, in turn, gave them to the Pacific Navigation Company. In 1897, this company was liquidated, and its interests were sold first to William Ansel Kinney, and then to Fred Wunderburg. The third Wilkinson heir sold his rights to William Ringer. Meanwhile, in 1889, Commander Nichols of HMS Cormorant claimed Palmyra for the United Kingdom, unaware of the prior claim made by Hawaii. In 1898, the United States annexed Hawaii, and Palmyra with it. On June 14, 1900, Palmyra became part of the new Territory of Hawaii. To end all British claims, Congress passed a second act of annexation in 1911. This act made Palmyra the only "incorporated territory" of the United States at that time. With imminent opening of the Panama Canal, Palmyra became strategically important. Britain had established a submarine cable station for the All Red Line on nearby Fanning Island. So the U.S. Navy sent USS West Virginia to Palmyra, where on February 21, 1912, American sovereignty was formally reaffirmed. In 1912, Henry Ernest Cooper (1857–1929) acquired William Ringer's property rights to Palmyra and, after a challenge in court, he became the sole owner of the atoll. Cooper visited the island in July 1913 with the scientists Charles Montague Cooke, Jr., and Joseph F. Rock, who wrote up a scientific description of the atoll. On August 19, 1922, Cooper sold the whole atoll except two minor islets to Leslie and Ellen Fullard-Leo for $15,000. They established the Palmyra Copra Company to harvest the coconuts growing on the atoll. Their three sons, including actor Leslie Vincent, continued as the owners afterwards, except for the period of administration by the Navy during World War II (1940–1945). In 1934, Johnston Atoll, Kingman Reef, and Palmyra were placed under the jurisdiction of the Department of the Navy. The Navy took over the atoll for use as the Palmyra Island Naval Air Station on August 15, 1941. From November 1939 through 1947, the atoll had resident Federal Government representatives, the island commanders. After World War II, much of the Naval Air Station was demolished, with some of the materials piled up and burned on the atoll, dumped into the lagoon, or in the case of unexploded ordnance on some islets, just left in place. 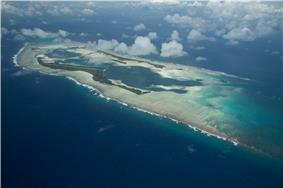 After the war, the Fullard-Leo family sued for the return of the ownership of Palmyra Atoll. The case went all the way up to the Supreme Court. The family won its case in United States v. Fullard-Leo, 331 U.S. 256 (1947). As of 2007, descendants of Henry Cooper still owned the two small islets not sold in 1922. When Hawaii was admitted to the United States in 1959, Palmyra was explicitly separated from the new state as a federal incorporated territory, administered by the Department of the Interior. In 1962, the Department of Defense used Palmyra as an observation site during several high-altitude nuclear weapons tests high above Johnston Atoll. A group of about ten men supported the observation posts during this series of tests, while about 40 people carried out the observations. 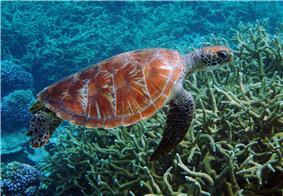 In December 2000, most of Palmyra Atoll was bought by The Nature Conservancy for coral reef conservation and research. In 2003, a scientific study was published about fossilized coral that was washing up on Palmyra. This fossilized coral was examined for evidence of the behavior of the effect of El Niño on the tropical Pacific Ocean over the past 1,000 years. In November 2005, The Nature Conservancy established a new research station on Palmyra to study global warming, the disappearing coral reefs, invasive species, and other environmental concerns. 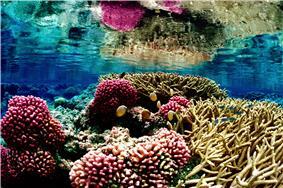 The Pacific Remote Islands Marine National Monument, including Palmyra Atoll, was established on January 6, 2009. The Secretary of the Interior has delegated the responsibility for supervising this National Monument to the U.S. Fish and Wildlife Service. "We will close the refuge to commercial fishing but will permit a low level of compatible recreational fishing for bonefishing and deep water sportfishing under programs that we will carefully manage to ensure compatibility with refuge purposes. . . . Management actions will include protection of the refuge waters and wildlife from commercial fishing activities." In March 2003, The Nature Conservancy conveyed 416 acres (1.68 km2) of the emergent land of Palmyra to the United States to be included in the refuge. It subsequently added 28 more acres to the conveyance. In January 2007, commercial fishing interests sued the United States in the Court of Federal Claims alleging that, under the Takings Clause, the Interior Department regulation had “directly confiscated, taken, and rendered wholly and completely worthless” their purported property interests. The United States filed a motion to dismiss the lawsuit, and the court granted the motion. On April 9, 2009, the court's decision was affirmed by the Court of Appeals for the Federal Circuit. In 2011, the U.S. Fish and Wildlife Service, the Nature Conservancy, and Island Conservation began an extensive program to eradicate the large population of non-native rats that had arrived on Palmyra during World War II. As many as 30,000 rats once roamed the atoll, eating the eggs of native seabirds and destroying the seedlings of one of the largest remaining stands of Pisonia grandis trees in the Pacific. These efforts were successfully concluded in 2012—with respect to rodent removal, however fifty-one animal samples representing 15 species of birds, fish, reptiles and invertebrates were collected for residue analysis during systematic searches or as nontarget mortalities. Brodifacoum residues (the toxicant employed during the project) were detected in most (84.3%) of the samples analyzed with unknown long-term and sublethal effects. Limited visits to the refuge are allowed, including by private recreational sailboat or motorboat. Visits must have prior approval, with access to Cooper Island arranged through the Nature Conservancy. In 1974, Palmyra was the site of the double murder of a wealthy San Diego couple, Malcolm "Mac" Graham and his wife, Eleanor "Muff" Graham. The mysterious deaths, murder conviction of Duane (“Buck”) Walker (aka Wesley G. Walker) and acquittal of his girlfriend, Stephanie Stearns, made headlines nationwide and led to a best-selling account written by Stearns's defense attorney, Vincent Bugliosi, and Bruce B. Henderson in the true crime book And the Sea Will Tell. The book led to a CBS television miniseries by the same name starring James Brolin, Rachel Ward and Hart Bochner. The story was also depicted in The FBI Files. Walker and Stearns were arrested in Honolulu in 1974 after returning from Palmyra aboard the Sea Wind, a yacht stolen from the Grahams. Because no bodies were found at the time, Walker and Stearns were convicted only for the yacht theft in August 1975. Six years later, a partially buried corroded chest was found in a lagoon at Palmyra, containing Eleanor Graham's remains. Walker and Stearns were arrested in Arizona for murder. Walker was convicted in 1985. Stearns was acquitted in 1986 after her defense argued that Walker committed the murders without Stearns's knowledge. Walker served 22 years in the United States Penitentiary, Victorville, California before receiving parole in 2007. Walker died on April 26, 2010. Mac Graham's body remains undiscovered. 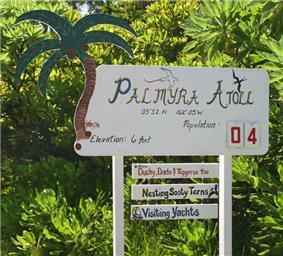 ^ "Palmyra Atoll". Office of Insular Affairs. US Department of Interior. Retrieved February 25, 2013. ^ Sterling, Eleanor (July 28, 2010). "In the Middle of Nowhere, Snooping on Sea Turtles". New York Times. Retrieved September 28, 2010. ^ Unattributed. "PARC Member Institutions". palmyraresearch.org. Retrieved September 28, 2010. ^ Title 48 Chapter 3. US Code Collection. Cornell Law School. URL retrieved February 10, 2007. ^ Thomas, H.F., "Premonition of Danger" in "Connecticut Circle". Fate, March 1953; see also Gaddis, Vincent H. Invisible Horizons Ace Books, Inc., 1965. ^ "Palmyra Island". The Evening Bulletin (Honolulu). August 14, 1897. Retrieved August 20, 2010. ^ a b "Contest Cooper's Claim to Palmyra". The Hawaiian Gazette (Honolulu). May 3, 1912. Retrieved August 20, 2010. ^ "Has Prior Claim: Palmyra Claimed by Kamehameha". The Hawaiian Gazette (Honolulu). August 13, 1897. Retrieved August 20, 2010. ^ "Palmyra Title May Now be Tested: Sale of Fanning Brings the Little Hawaiian-Owned Group into Prominence". The Hawaiian Gazette (Honolulu). January 16, 1912. Retrieved August 20, 2010. ^ Palmyra Atoll: WWII Naval Air Station Contaminant Impacts on Terrestrial and Marine Ecosystems within the USFWS National Wildlife Refuge, Columbia Environmental Research Center, U.S. Geological Survey. ^ "Opening of The Nature Conservancy Research Station on Palmyra Atoll". Hawai'i Post. Retrieved August 20, 2010. ^ "Pacific Remote Islands Marine National Monument". fws.gov. U.S. Fish and Wildlife Service. Retrieved July 31, 2009. ^ Palmyra Pac. Seafoods, L.L.C. v. United States , 80 Fed. Cl. 228 (U.S. Court of Federal Claims 2008). ^ Palmyra Pacific Seafoods v. U.S. , 561 F.3d 1361 (Fed. Cir. 2009). ^ Pitt, W.C.; Berentsen, A.R. ; Volker, S.F. ; Eisemann, J.D. (September 2012). "Palmyra Atoll Rainforest Restoration Project: Monitoring Results for the Application of Broadcast of Brodifacoum 25W: Conservation to Eradicate Rats". QA-1875 Final Report. Hilo, Hawaii: USDA, APHIS, W, NWRC. Retrieved August 22, 2013. 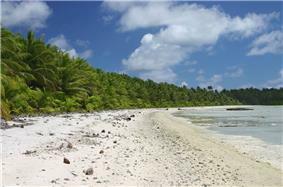 ^ "Native species expected to rebound on rat-free Palmyra Atoll". Saipan Tribune (Press release). February 7, 2013. Retrieved August 22, 2013. ^ "Visiting Palmyra Atoll National Wildlife Refuge". fws.gov. U.S. Fish and Wildlife Service. Retrieved February 12, 2013. ^ "Palmyra's scads of rats rival its crabs and birds". HonoluluAdvertiser.com.